The /* Output: tag indicates the beginning of the output that will be generated by this file. so you can see the output and know that it is correct. The user must also type all these long names, so be merciful. curly braces that you see used in this book. The goal of this chapter is just enough Java to understand how to write a simple program. show you how to control the flow of your program. learning how to write basic programs so all the exercises were delayed until the end. exercise is, in a ranking from 1-10.
available for sale from www.MindView.net. these guidelines could be followed, but you\u2019ll see that the style I use here matches the Java standard as much as possible. print their values to verify that Java performs default initialization. environment than the JDK, learn how to compile and run programs in that environment. program that compiles and runs. are assigned to and printed in main( ). as a code fragment in this chapter. Exercise 7: (1) Turn the Incrementable code fragments into a working program. primitive types and their wrappers. line. To do this, you\u2019ll need to index into the command-line array of Strings. Exercise 15: (1) Take the program in Exercise 2 and add comment documentation to it. HTML file using Javadoc and view it with your Web browser. At the lowest level, data in Java is manipulated using operators. programmers. Java has also added some improvements and simplifications. 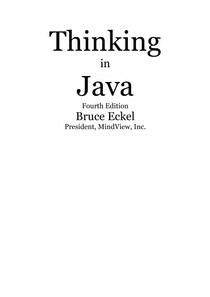 fundamentals necessary to learn Java. simpler approach to such a commonly used statement.